Real estate is a sector very much of the physical world, comprised of bricks and mortar, stone and concrete – and yet it stands to benefit enormously from digitalisation. This is obvious for two clear reasons. First, real estate is typically an expensive investment and therefore the scope for efficiency gains in time and cost are significant. Second, real estate requires substantial resources to manage, optimise, buy and sell. The processes which underpin real estate management – from development, to property maintenance, administration, leasing, transactions and finance – are complex. Digitalising these processes can increase efficiencies, expand productivity and knowledge and ultimately enhance CRE value creation. Digitalisation of any value chain comes in two stages. The first stage uses new digital technologies to optimize existing internal value chains. The second stage is where value chains are extended to the client of your clients – connecting across traditional sector boundaries and creating multi-sector integrated networks. For most in commercial real estate (CRE), the first stage has not even completed. In this article, we will explore how first-stage digitalisation can optimize real estate management through two examples. The first centres on the most important piece of the digitalised value chain: continuous free-flowing data and analytics. Access to real-time data is, for many, the base requirement. The institutionalisation of CRE has increased dramatically over the last decade, driven by institutional investor capital flows into the sector. These investors are used to real-time data in equities and fixed income and expect the same in CRE. It is already the base requirement and new technologies is accelerating the sector’s ability to meet these requirements. Real-time data underpins the digitalized real estate investment management process. (Below is our first attempt at cataloguing the major real estate investment management processes and sub-processes. Let us know how you think digitalisation will change this cycle). Most real estate companies are already sitting on significant pools of their own private data, slavishly captured from all transaction undertaken in their business – as well as all the transactions bid on but did not win and all the portfolios they were shown and declined. All this, in addition to all the data in the public domain – by which we mean public data sets available from subscription services, to data from brokerage, legal and professional advisory firms and even news and press announcements. In a data and documentation-intensive sector like real estate, data management is a significant administrative task – spanning leasing, legal, transaction, non-disclosure agreements, joint venture agreements, finance, accountancy, insurance, news and more. The intersection of several technology innovations has eliminated the humdrum administrative data capture process and dramatically enhanced the data-driven insights. First up is data mining, which is a computing technique focused on interrogating large datasets to extract information of human-defined interest including processing information in any language vastly simplifying data management. This initial process of knowledge discovery intersects with machine learning (ML), a sub-branch of artificial intelligence (AI) in which computers can write their own code to solve problems through algorithms. ML effectively teaches computers how to learn like us and improve from experience – all without human engagement. This technology can be applied to the aggregation of real estate companies’ private commercial property database in single unified format – alike online UK property database Realla – supplemented by external sources and including the processing of portfolio marketing brochures into a structured, consistent format. ML technology has also given rise to new online marketplaces in real estate for raising equity and debt in two distinct approaches. The peer-to-peer (P2P) approach – notably popular in the lending space – is the practice of unrelated individuals or companies lending money directly to one another, circumventing the traditional banking model. Examples of this approach include by Proplend, which arranges funding for income-producing offices, industrial, leisure, retail and residential blocks in England and Wales, and LendInvest, specialists in short-term bridge finance and developments which also has created a UK online marketplace for individuals and institutions to invest in property backed loans. The P2P model is not to be confused with crowdsourcing, which enables groups of unrelated investors to pool their capital together to equity finance real estate transactions. Online marketplaces for real estate investing – such as RealtyMogul and Katipult in the US – which connect individuals with commercial real estate investment opportunities, bypassing brokerage firms. RealtyMogul’s technology extends to pooling capital into online real estate investment trusts, while Katipult’s platform expands to marketing and distribution, managing earnings repayments to investors, and performance reporting. Further down the technology rabbit hole is deep learning (DL), another sub-branch of machine learning, which replicates problem-solving either through replicating human or entirely self-taught “artificial thinking” processes. Deep learning is an advanced form of machine learning capable of deciphering interpreting complex information – whether text, speech, photos, audio – with increasing accuracy over time. Imagine holding up your smart phone, opening an application and the screen telling you what you are looking at with huge accuracy: whether it is a restaurant, a flower, a commercial building. That’s the power of deep learning and it is upon us imminently. At Google’s I/O developer conference in March, CEO Sundar Pichai, announced Google Lens. Pichai told delegates that Google’s progress had elevated its own AI’s image recognition to levels above humans. Google Lens will understand what you see to help you take action, Pichai said. Now, imagine attending a commercial property site visit, holding up your smartphone, or tablet, and seeing all your companies’ public and private information and actionable tasks connected to that asset, including tenancy information and discussions. And then turning to the neighbouring asset, which is not owned by your company, and seeing the most up-to-date public information on that asset. It would certainly make asset tours more informative. Together, data mining, machine learning and deep learning technologies can process vast volumes of unstructured data, documents, photos, audio and video in multiple languages, dissect salient information, and deliver unified structure information in real-time with scenario-based actionable insights. All of which continues to improve over time. to re-align the priorities of property owners, managers and tenants which historically have been governed by misaligned incentives. to provide the best experience for tenants by promoting well-being which in turn will enhance corporate productivity. optimise process management and deliver improved building performance and return for landlords. Smart buildings begin with a range of smart sensors collect a huge amount of data related to building operations and the environment – including motion, pressure, light and temperature. The collective structured and unstructured data can be aggregated on a real-time basis at a building, portfolio, and even metropolitan level as the information flows through a network which enables other smart buildings to communicate. Over time, IoT will become ubiquitous and invisible, managing and administrating for us with increased effectiveness, supported by a massive positive feedback loop derived from all the learning of all machines connected to the internet. The graphic below, by Deloitte, shows the CRE information value loop created by smart buildings. The process cuts across many separate functions within the traditional real estate investment management process. “The aggregated information can be analysed using different tools to develop descriptive, prescriptive, and predictive insights for building operations teams (both landlords and tenants),” wrote Deloitte in a report entitled Smart buildings: How IoT technology aims to add value for real estate companies. 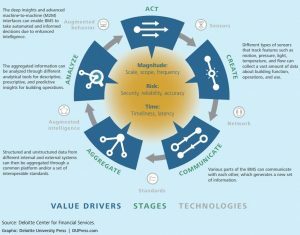 “The loop is completed when the BMS demonstrates augmented behaviour in the form of increased automated actions related to monitoring and tracking, among other things, or influencing human decisions for both the landlord and tenant.” In Deloitte’s illustration, the amount of value created by information passing through the loop is a function of the value drivers identified in the middle – magnitude, risk, and time. In the next article, we will consider how digitalisation of value chains can be extended into adjacent and complimentary markets creating multi-sector ecosystems.